The program seeks to help homeowners stay in their houses and limit the spread of “zombie” properties. New York State has taken over 92 distressed mortgages on Long Island to help homeowners avoid foreclosure and prevent homes from becoming “zombie” properties. The state’s Community Restoration Fund purchased the loans along with 80 others throughout New York, officials said Wednesday. The transaction was funded by about $3 million from state settlements with major lenders over foreclosure abuses. It also included more than $35 million in privately funded debt and equity investments. Last summer, the state purchased the mortgages of 203 Long Island households and 195 loans elsewhere in the state. Taken together, the two purchases involved $10 million in bank settlement funds and more than $111 million in private investments. “New York continues to fight the spread of zombie properties by supporting homeowners seeking the American dream,” Gov. Andrew Cuomo said in a statement. The state’s main goal is to help homeowners stay in their homes — though New York could end up getting its money back, since homeowners are expected to start making payments again, state officials said. In the program, the state refers homeowners facing foreclosure to housing counselors, who aim to reduce interest rates, and in some cases forgive part of the debt. Helping homeowners avoid foreclosure “is going to stabilize the neighborhood and have a homeowner back on the tax rolls,” said Carol Yopp, director of counseling at the Hauppauge-based Long Island Housing Partnership, one of the local groups counseling homeowners. 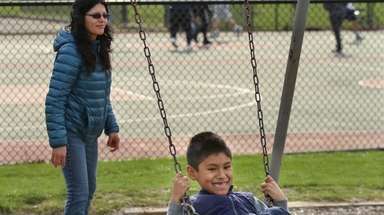 Among the homeowners in the first round of loan purchases is Jose Portillo, 40, who works at a factory making skylights and lives in Brentwood with his wife and their two children, ages 11 and 5. They fell behind on their mortgage after Portillo lost his second job cleaning offices. He has since gotten a new second job. Portillo was approved for a trial mortgage modification that lowered his interest rate from 7.5 percent to 4.625 percent, said Carrie Roman, his counselor at the Long Island Housing Partnership. The goal is to limit payments to 35 percent of a homeowner’s income, said Wayne Meyer, president of New Jersey Community Capital, the not-for-profit group that arranged the recent loan purchase from Fannie Mae, the government-backed mortgage giant. The New York loans were part of a larger pool of 495 loans nationwide that were purchased last week, with the New Jersey group putting in its own funds and managing the transaction, Meyer said. The two rounds of loan purchases represent almost $120 million in outstanding debt among the Long Island homeowners, according to the New Jersey group. Homeowners who cannot afford even a modified loan can receive payments to help them start over elsewhere, and if a property has been abandoned, it would be sold to a new owner, Meyer said.